Whoever said being a parent would be easy? Most parents will tell you that having kids is demanding, frustrating and exhausting at times, no matter how much you love your offspring. Things can become even more challenging when it comes to how you discipline your children. The smacking debate goes on and on – and many parents will admit to having smacked a child when they have seen no other option, or the child has been especially naughty. Currently the law allows what it calls ‘mild smacking’ which is described as reasonable chastisement. However, any punishment which leaves a child with visible injury such as bruising, grazes, scratches, swellings or cuts can land you in jail on a charge of common assault. There are other ways to discipline a child which don’t involve smacking – and all of these techniques will help you build a good relationship with your children that doesn’t use fear as a mechanism to get them to behave. Children naturally want to please their parent, even when they are pushing the boundaries a little, so make the most of this! Try pointing at something to get their attention and focus it away from them. Look out of the window at something that’s moving, show an attractive object or shake something that makes a noise. Often this can be enough to stop the grizzles. Toddlers are just starting to realize that they can get around independently, and want to see what they can do. They are endlessly excited by their surroundings and like to see what things do, where they go...and this can get them into trouble! Misbehaving in toddlers is just part of growing. They will test their limits – and your patience, on a regular basis. When they don’t get their way, or get frustrated...they also have tantrums. Deal with the terrible twos by making sure you tell them how good they are when they are behaving well. Try and ignore bad behaviour if you can and it’s not harmful...and when the dreaded tantrums arise, try to acknowledge your child’s feelings by talking to them. 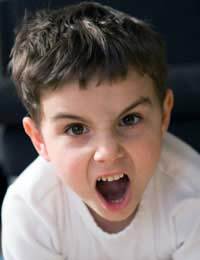 It’s easier said than done perhaps, but if you can talk a toddler down from his or her tantrum by saying, “Yes, I know you are upset, but you can’t have that toy” – and refuse to either give in or become angry yourself, it defeats the object of the tantrum, which is to get your attention and get their own way. All school age children like to be cheeky and misbehave at times. It’s their way of showing independence and often ad behaviour is just copying what they learn from school mates. Try to talk to your child about school, and nip any potential bullying or worries about school in the bud. Always offer a listening ear for their problems – and triumphs – and your children will feel that they don’t need to resort to bad behaviour to get your attention. If your child is being naughty, try the 'broken record' technique, repeating over and over, very calmly, “Will you please tidy your bedroom?” or whatever it is that you’ve asked them to do. Very bad behaviour can be dealt with by removing toys or privileges – older children hate to be ‘grounded’ and younger ones can have their Playstation time restricted! The teenage years can be a nightmare with children starting to assert their independence. Teens always know best and will push every boundary and break every rule you set. They will argue with you, slam doors and probably do most of the things you’ve told them they shouldn’t. Dealing with teen behaviour positively can be almost impossible as you’re dealing with a near-adult who is probably as big as you are! Try not to take it to heart if they are defying you – it’s not personal, they are just being a teenager. Keep talking and communicating with the stroppy teen as much as you can. If you can build trust, you may find that your child finds it harder to do the things you’ve asked them not to do, because they don’t want to let you down. It also means they can come to you if they are in real trouble. Teenagers respond to negotiations in a way younger children don’t. If you can agree on some compromises rather than barking orders, and show that you trust your child, any unruly behaviour might be avoided or at least reduced.